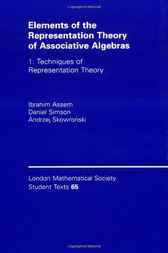 This first part of a two-volume set offers a modern account of the representation theory of finite dimensional associative algebras over an algebraically closed field. The authors present this topic from the perspective of linear representations of finite-oriented graphs (quivers) and homological algebra. The self-contained treatment constitutes an elementary, up-to-date introduction to the subject using, on the one hand, quiver-theoretical techniques and, on the other, tilting theory and integral quadratic forms. Key features include many illustrative examples, plus a large number of end-of-chapter exercises. The detailed proofs make this work suitable both for courses and seminars, and for self-study. The volume will be of great interest to graduate students beginning research in the representation theory of algebras and to mathematicians from other fields.